My fiancé and I got engaged recently, so we are now in the midst of planning for our wedding and applying for a BTO (Built-To-Order) flat. It actually throws me off how fast things are moving along. These milestones had seemed far away five years ago, and I never took the chance to mull over it then — now I’m regretting not saving for these expenses earlier. I’ve come to realise that our “future” comes sooner than we think. The earlier we start planning, the more time we will have for our savings to accumulate and grow. Saving is clearly a continuous cycle, but when should we start? How Are Millennials Planning For Their Future? I interviewed three fellow millennials on their saving habits and found that all of them set aside 20 to 40 per cent of their income as savings. Johnathan Chua, 28, is another millennial who makes such investments. Besides being fully insured, he deposits 25% of his take-home salary into his savings account. Janielson Foong, 26, sets aside an “emergency fund” for future needs such as unforeseen health scares. However, he hasn’t set aside a fixed amount for this emergency fund, so there are months when he ends up overspending, which he admits isn’t the most ideal situation. “I’m actually already saving up for a BTO even though I don’t have a girlfriend now,” he chuckles. “While others may think that I’m ‘kiasu’, I want to be prepared for my future and ease any potential financial burdens from my future fiancée. I’m just glad that my CPF savings can be used to support home ownership,” said Janielson. Melissa, who had also applied for a BTO recently, shares the same sentiment as him. She’s glad that her CPF savings can help relieve some of her housing expenses. Saving For Retirement: Now, Or Later? These three millennials have started putting away money for their future needs in some form of a savings plan. Spurred by this little observation, I began looking deeper into the ways in which they can further grow their retirement savings. 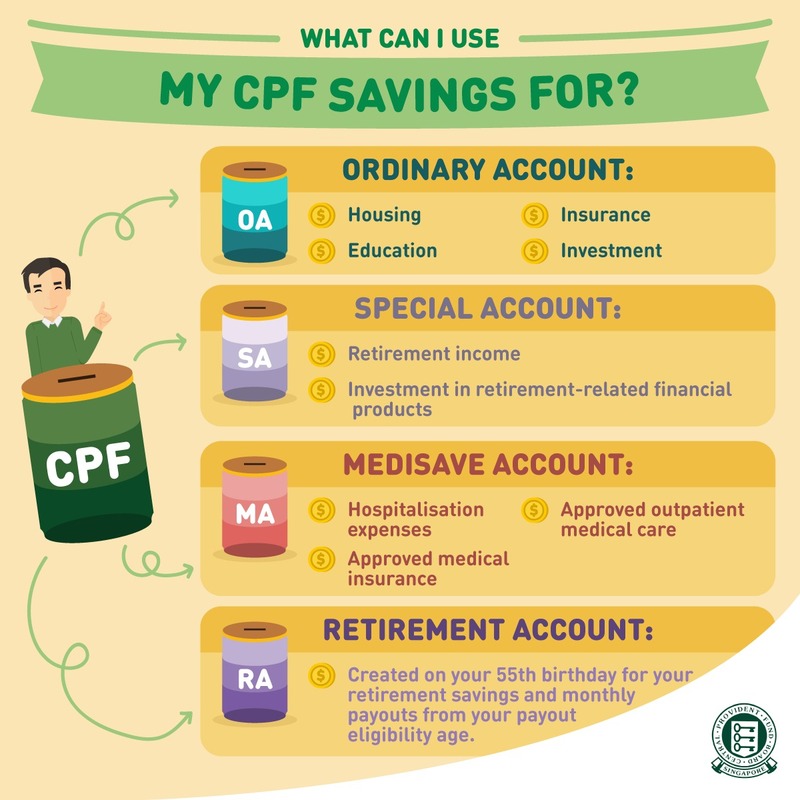 For most of us, our CPF savings will be the foundation for our retirement, so it’s important to know what happens to our monthly contributions, and understand what our CPF savings can be used for. The Special Account (SA) in particular, is dedicated to retirement funds. This means that even if most of one’s CPF savings have been used (e.g. to purchase a house with Ordinary Account or OA savings), there will still be savings safely parked aside for retirement. When you turn 55, a Retirement Account (RA) will be created for you. Here on, the savings from your SA and/or OA, up to your Full Retirement Sum (FRS), will then be transferred to your RA to form your retirement sum. This retirement sum will provide you with a monthly payout once you’ve reached the payout eligibility age, which is 65 for those born in or after 1954. 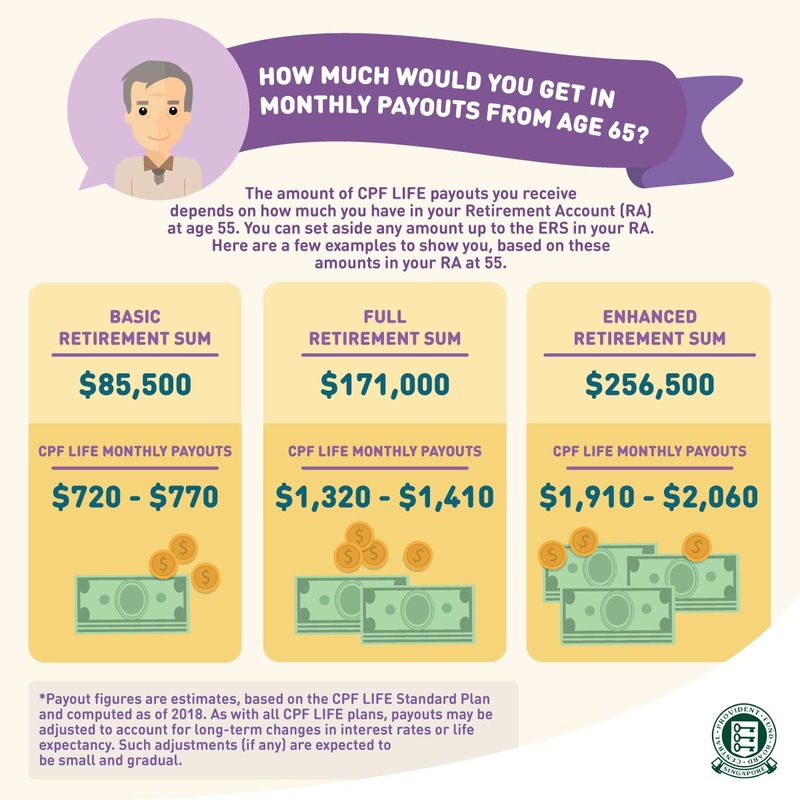 Under the CPF LIFE scheme, you will receive monthly payouts for as long as you live. “These lifelong monthly payouts mean that I won’t have to worry about outliving my retirement savings. Regardless of what age I live to, I will still continue to receive payouts and be assured that my basic retirement needs will be taken care of in my golden years,” said Janielson. As the amount of monthly payout you receive is dependent on the amount in your RA, it simply means that the more you set aside in your RA, the higher your payouts will be. 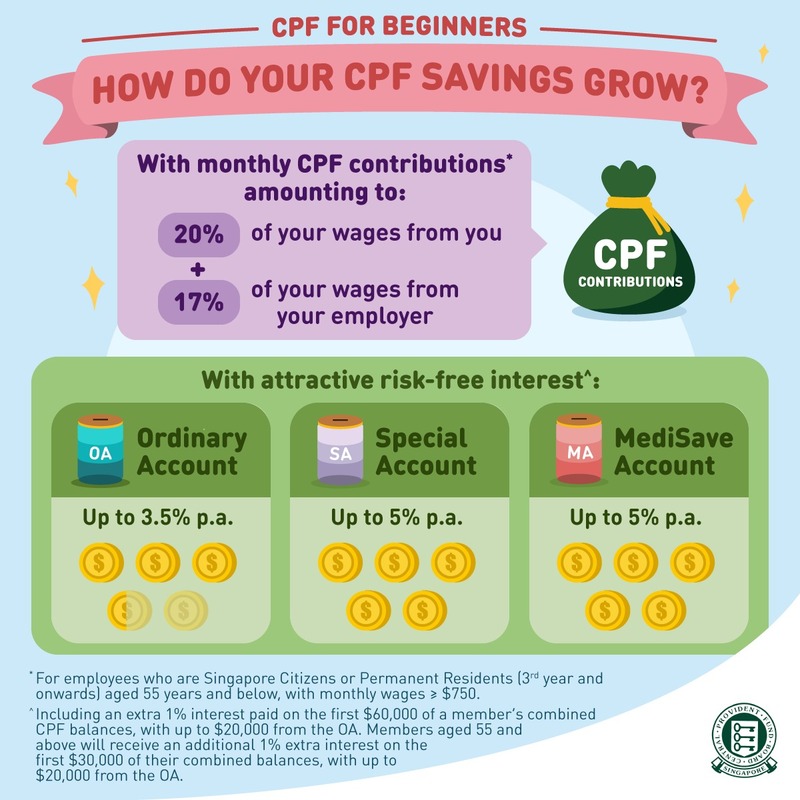 Besides your monthly contributions, there are other ways to grow your CPF savings. One simple and direct way is to make cash top-ups and CPF transfers. Melissa, for one, intends to top up her SA so she can enjoy higher monthly payouts to help tide through her retirement years comfortably. 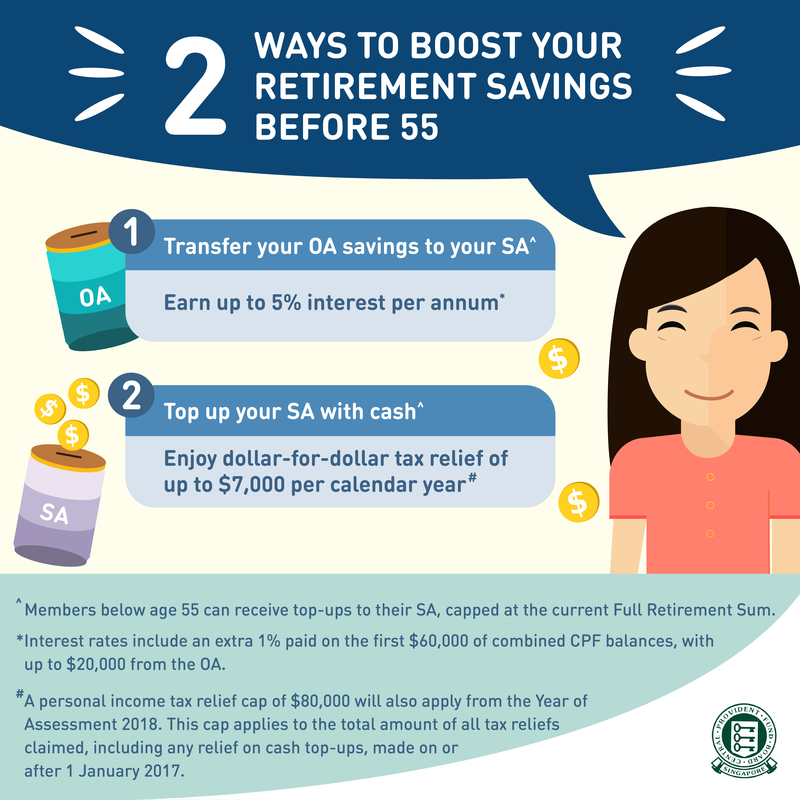 With the attractive risk-free interest of up to 5% per annum, her CPF savings will grow over time and she can have more in her retirement years. While the future may seem distant now, remember that time flies fast! When I attended the Backstreet Boys concert in Singapore last year, it made me realise that the ‘boys’ I used to fangirl over are now in their late thirties to mid-forties! And all their songs, which were hits back in the day, are now the same age as a secondary school student. While time flies, you are the pilot — it’s up to you how you want to navigate the future. But if you’ve been prudent with your money and have additional savings, you should definitely consider topping up your CPF SA to receive higher monthly payouts in the future. Don’t just take our word for it: CPF has been ranked as one of the best pension systems in the world, so you can be sure that your basic retirement needs will be covered. It is never too early to start preparing for retirement because time is your best asset to grow your savings. Don’t take the years ahead of you for granted! Visit CPF’s Be Ready Website to learn more on how to financially prepare yourself for the future. This article was written in collaboration with CPF Board. The post What’s Life After 40 Years Of Work? We Asked 3 S’pore Millennials About Their Saving Habits appeared first on Vulcan Post.